"Pastry is different from cooking because you have to consider the chemistry, beauty and flavor. It's not just sugar and eggs thrown together. I tell my pastry chefs to be in tune for all of this. You have to be challenged by using secret or unusual ingredients." With places like Mike's Pastry, Bova's Bakery and Modern Pastry, does the North End really need another bakery? If another bakery wanted to make inroads into the North End, it would need a highly talented Pastry Chef as well as offer something significantly different from many of the other bakeries. Well, the new Bread + Butter bakery and cafe may fit that bill and I highly recommend that you visit this new spot and partake of their baked wonders. The owner/chef is Lee Napoli (pictured above), a skilled Pastry Chef who has worked at or consulted at such Boston area restaurants as Icarus, Maison Robert, Grill 23, Anago, Metro, Bricco, The Buttery and Sandrine’s Bistro. In addition, she established the region’s first and only association for pastry professionals, the Professional Pastry Guild of New England. She is also the owner of Chocolee Chocolates, located in the South End, which has long been my favorite chocolate shop in the city. I was excited to learn that Lee was opening a bakery & cafe in the North End, believing it would be a hit as well. Bread + Butter is located at the former spot of Caffé Graffiti, at the intersection of Cross and Salem streets. For the summer, much of the space is open to the air, and the outside patio will seat about 30 people. While relaxing on a bench or in the grass at the nearby Rose Kennedy Greenway, you can view the restaurant, and when you see everyone dining there, it may entice you to check it out. The inside is small, with approximately ten tables, but the open walls make it seem much roomier. The bakery-cafe sells both savory and sweet items, from sandwiches to chocolates, salads to cookies. Most of the baked goods and pastries are visible on the long counter, and I am sure you will be enticed by multiple items. As it is still new, selections may change with time as they hone and revise their menu selections. The key here is that this is not a traditional Italian bakery, so its offerings are very different than what you will find at other North End bakeries. There is no Cannoli, no La Sfogliatella, no Pizzelle. Instead, you will find creative offerings which you might find at other artisan bakeries, all with Chef Napoli's unique touches. Behind the front counter, you can see partially into the kitchen where all of the magic bakery is taking place. You might even see Chef Napoli working on some new creation. I was recently invited to a media tasting, and got to sample some of the delicious items coming out of this kitchen. Bread+ Butter is open for breakfast, and serves a variety of enticing items including scones, danish, croissants, quiche and muffins. They even serve a Breakfast Pizza, topped with a poached egg and assorted savory toppings. I didn't get a chance to taste the pizza but I will do so on one of my next visits. They also sell a variety of coffees and teas, including iced tea, as well as their own House Made Sparkling Sodas. I tried the Raspberry soda, and after a good stir, it was a refreshing drink with only a mild sweetness. For lunch, you can find an assortment of Sandwiches (most for $7.95) and Salads ($6-$9). Try a BBQ Pulled Pork or a Duck Confit. Or maybe a Kale & Farro Salad or a Caesar Salad. All of the breads are made in house, and the exact type will vary from day to day. The baguettes are delicious, with just that right combination of textures, a crustier exterior but a soft fluffy interior. And they make for good sandwich bread, not too heavy or tough. It is the pastries which will most intrigue and delight your taste buds. They sell chocolates and truffles from Chocolee Chocolates, though it will mainly be mixed boxes, giving you an assortment of chocolate treasures. You will find other treats too, such as Hand-Dipped Eclairs, Beignets, Cakes and Tarts Du Jour, Cheesecake, Lemon Almond Cake, Brownies, and much more. I have had the eclairs and beignets at Chocolee Chocolates are they were excellent, with compelling fillings or rich cream or chocolate. You will find a few different croissants, including a Ham & Cheese Croissant. Pure enjoyment! Flaky, light, and buttery with a bit of saltiness from the ham. An excellent croissant, and I suspect all of the varieties will be equally as good. The Nutella Danish, visible above in pieces in the right hand corner, is also flaky and light, with intriguing notes of nuts, cinnamon and creamy chocolate. Another winner, well balanced flavors sure to please. The deliciousness continues. The Pecan Roll is a soft mound of sticky, nutty goodness. Trying to decide which pastry to order is difficult with all of these excellent choices available. I am a fan of coconut, and a cookie made of all coconut, a macaroon, has always appealed to me. Their macaroons are moist, not too dense, and have a nice drizzle of chocolate over them. Definitely one of the better coconut macaroons I have tasted. Maybe the most compelling pastry though was the Queen's Pastry, the item in the back of the above photo with a toothpick in it. Based on an old French recipe, it is sometimes described as a cross between a croissant and a puff pastry. In the past, it might have been the scraps of these items, combined, and put into a mold. Here, it is a yeasted butter dough with salt and sugar. It is light and airy, with an exquisite melange of sweet and salty, an addictive treat which you could easily devour and then desire another. A couple of the baked goods were good, but not especially interesting like the items I have highlighted above. However, this is a brand new bakery so it will need a little time to work out any kinks, and decide which baked goods are the best for them. Overall, I am impressed with Bread+ Butter and think Chef Napoli has another winner on her hands. It is a worthy addition to the North End. I will certainly be back to try more of the menu and it receives my highest recommendation. Beginning this spring, Matt & Kate Jennings and the Farmstead team share age-old family recipes in a weekly Sunday Supper series. Diners are welcomed for three-course family-style feasts of homespun classics with a Farmstead twist, served communally with an optional beverage pairing (two hand-selected wines from the restaurant’s cellar, one cocktail or a beer-and-shot combo, depending on the menu). The full bistro menu will also be available during Sunday-night dinner starting June 9. Reservations accepted but not required. June 9: Melville Rangoon and "Duck Sauce"
Round off your weekends Jennings-style with once-a-month Sunday-morning brunches done up the Farmstead way. Midday meals include playful takes on brunch standards featuring monthly changing options like Sweet Pea Waffles with Smoked Salmon, Fried Mortadella & Pancake Sandwiches, Papas Gordas and House-Made Cider Doughnuts. Reservations suggested but not required. 2) It’s the mother of all pop-up dinners this June when Matt Jennings of Providence bistro/artisanal shop Farmstead, Inc. gathers ten of his closest friends – who also happen to be dynamite chefs from Boston, New York and Canada – for the first-ever Northern Alliance Dinner at jm Curley in Boston. Celebrating the camaraderie, creative collaboration and shared inspiration between US and Canadian chefs, the dinner features a multi-course meal of neo-traditional North American cuisine from ten culinary all-stars. The evening begins with a reception of chef favorites Fernet Branca and Bols Genever soaked up with passed apps, followed by five collaborative courses with beverage pairings. Proceeds from the Northern Alliance dinner support a favorite charity of the US chefs – the American Farmland Trust – in its mission to support and protect small family farms. A second event later this summer in Montreal will support an organization close to the Canadian chefs’ hearts. 3) Lucia Ristorante Owner Donato Frattaroli and Executive Chef Pino Maffeo introduce the next class in the Lucia Winchester cooking series: Pasta. Guests will learn how to make Mama Lucia's Traditional Italian Lasagna, Pasta al Forno and Maccheroni Chittara. Attendees will learn the secrets of perfect pasta, sauce and pairings. Class will conclude with a family-style dinner. When: Wednesday, June 5, from 6:30p.m.-9 p.m. Cost: The cost is $50 plus $15 materials fee. Classes are held in downstairs kitchen. Students can sign up and pay at host station before class date or pay by credit card by phone. For more information or to book a spot, please call (781) 729-0515. 4) 62 Restaurant & Wine Bar in Salem is launching a new Tuesday Tasting wine series beginning Tuesday, May 28, featuring wine, food and a chance to mingle with friends new and old for only $25 per person. Guests can look forward to (4) unique wines and (4) creations presented by chef Antonio Bettencourt while learning about each wine. “We have a really robust wine program here and many times people are intimidated by a restaurant’s wine list. We wanted to create a unique series so that our guests can experience all that we have to offer in a relaxed, comfortable and most importantly, fun setting,” said Chef Bettencourt. A great deal for diners, the restaurant has added a fun twist to the series. Unlike typical wine dinners, each Tuesday night tasting has a unique theme meant to overcome some of the pretention associated with wine tastings. In addition to the wine pairings, guests will get a taste of true Italian authenticity as Chef Bettencourt serves up some of his paired spuntini and small plates. May 28: What’s the 411? This tasting will cover the wine tasting basics- highlighting grape varietals, their characteristics and where they are grown around the world. Terroir- What is it and why should I care? June 11: Pretty in Pink. At this wine tasting 62 is breaking the stigma of pink wine and setting the new rules for rose. Real men drink pink, too. August 20: ABC-- Anything But California – There’s more to U.S. wine than what’s grown in the Golden State. At this tasting guests will explore the other wine U.S. regions including Washington, Oregon, New York and even Massachusetts. October 15: American Heavy Hitters Big-boy Cabs and Zins that make you pay attention. 5) The Vermont Cheesemakers Festival will return to the shores of Lake Champlain this summer to celebrate Vermont cheeses, artisan foods, craft beers, local winesand the people who make them. The 5th Annual Vermont Cheesemakers Festival will be held on Sunday, July 21 at the Coach Barn at Shelburne Farms in Shelburne, VT from 10am-4pm. This years festival will feature over 200 cheeses from more than 40 cheesemakers, as well as dozens of artisan food producers, and local beer, wine and spirits producers. Tasting, pairing and sampling opportunities will be interspersed with cheesemaking and cooking demonstrations, and workshops throughout the day. This years Meet the Cheesemakers workshop series will be free with the price of admission, and offered on a first come, first serve basis. Murrays Cheese will share their Counter Intelligence with a workshop on affinage and the cave-aging process. The cheesemakers behind Vermonts well-loved cheddars will present Cheddar is a Verb, a workshop devoted to understanding what makes a great cheddar. Cheese Through the Seasons will delve into cheese seasonality and the subtle variations that result from the changing Vermont landscape. Two cooking demonstrations will also be offered free with admission-- Creative Cheese Boards with Chef Sean Buchanan of Black River Produce and Beyond Fondue: Cooking with Cheese with Chef David Hugo of Shelburne Farms. Tickets are $50 per person and include full access to all festival events, including workshops, demonstrations, and beer and wine tastings. Tickets are available online at www.vtcheesefest.com or by calling 802-86-FLYNN. The Festival typically sells out well in advance, so early ticket reservations are encouraged. This cheese fest is always a great time and I highly recommend you check it out. And make sure to get your tickets early as they only sell a limited amount and sell out every year. I have had little experience with authentic Cuban cuisine, which is commonly considered to be a mix of Spanish, African and Caribbean cuisines. So I was intrigued to learn of a new Cuban restaurant, the Oya Cuban Cafe, which recently came to Malden. It has only been open for a few months and I have dined there for lunch a couple times. Based on my experiences so far, it is a restaurant worth checking out. The restaurant is owned by a husband and wife team. Roberto and Maybi Niubo. Roberto, who was born and raised in Cuba, is the chef and began his culinary education in Cuba. He continued his education in Massachusetts, at the Le Cordon Bleu School of Culinary Arts in Cambridge. The name of the restaurant, Oyá, derives from a goddess in the Yoruba religion. Oyá is a warrior-spirit of the wind, lightning, fertility, fire, and magic. It is she who looks over the restaurant. The restaurants is simply decorated and seats about 38 people plus 6 at the small bar. It has a bit of a homey ambiance with a partially open kitchen. They recently obtained a license to sell wine and beer and their current wine list is small, about 14 wines, but the selections are actually interesting and relatively inexpensive. You'll find a Fino Sherry, a LBV Port, Cava, and other wines from Spain, Portugal, Argentina and elsewhere. Most of the bottles are priced under $30, with their highest wine at $36. Pretty good for a small restaurant. Their food is intended to be authentic, and nearly everything is made in house. That is certainly a good selling point. The Lunch menu is broken into Appetizers ($6-$12, Soups ($5), Salads ($3-$6), Sandwiches ($7-$10) and Entrees ($13-$15). The Dinner menu has additional choices, and prices are a bit higher for those items, with entrees up to $24 (a Filet Mignon). And yes, you will find a traditional Cuban sandwich on the Lunch menu, as well as sliders for Dinner. In the Appetizers, the Croquetas de Pollo ($7) are chicken croquettes served with a rustic Cuban sofrito sauce. The crunchy exterior hides the soft mashed potatoes and chicken within. They are filling and the sofrito is nicely spiced, with lots of flavor. 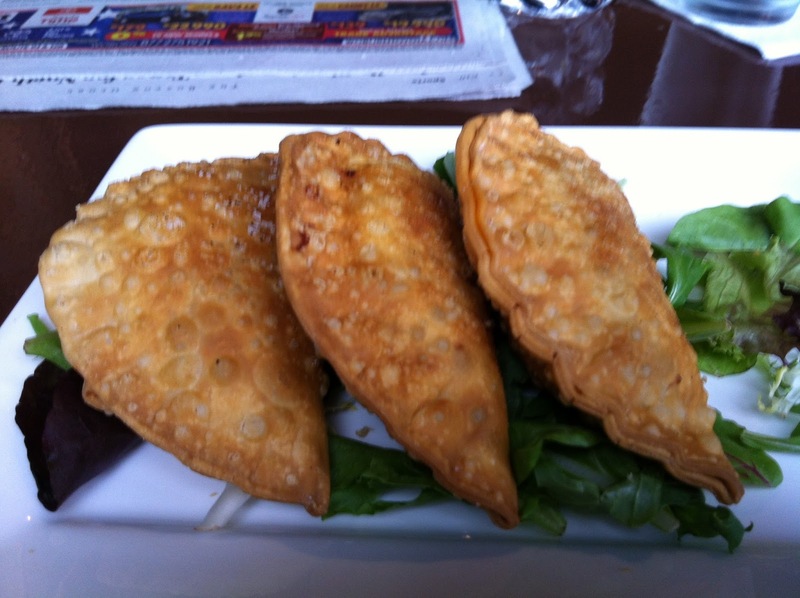 Another Appetizer is the Empanadas de Carne ($8), Beef Empanadas which are also served with a rustic Cuban sofrito. These were impressive, with a crisp, fresh tasting empanada containing a hot, juicy sauce with tender ground beef, olives and spices. I could have made a meal of these empanadas alone and they get my strongest recommendation. Under the Sandwiches, I ordered the Medianoche Oyá ($8), a "midnight" sandwich with BBQ slow roasted pork, chorizo, and melted Swiss Cheese on soft bread. It is called a "midnight" sandwich because it is popular in Cuban nightclubs around midnight. This is an ample sandwich, filled with plenty of flavorful meat and cheese. I should note that there are onions on the sandwich, within the roasted pork, though the onions are not listed as an ingredient. The bread was fresh and soft, pairing well with the stuffings and the addition of the chorizo was great. Next time, I need to try their Cuban. 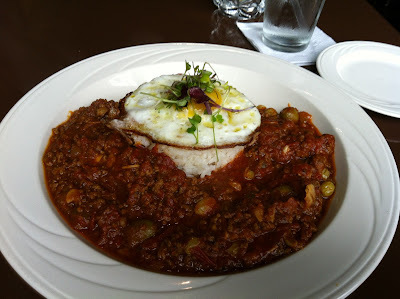 In the Entrees, I opted for the Arroz a la Cubana ($13), a plate of Cuban style ground beef, white rice and a fried egg with a side of Sweets Fried Plantains. The plentiful ground beef is within a compelling and tasty sauce which has olives, onions and what seem to be tiny grapes. It is a hearty dish, perfect for a rainy or cold day. The plantains though were a bit dry and not very exciting. The Dessert menu has four choices, priced $5-$6, and includes Rice Pudding and Caramel Flan. My choice though was the Pudín de Pan con Dulce de Leche y Helado ($6), a warm Bread Pudding with ice cream, and it was stellar. A great consistency and taste to the bread pudding, and the caramel sauce was enticing. The ice cream enhanced the dish and I would come to the restaurant just for this dessert. Highly recommended. Overall, the restaurant is making some excellent dishes, and a couple items which are more ordinary, though not unappealing. I still would like to try more items on the menu, especially on the dinner menu. Portion sizes are good and prices are very reasonable. Service is excellent, friendly and attentive. There is much reason to check out Oyá Cuban Cafe and get a taste of Cuba. As a child, I loved the movie Willy Wonka & The Chocolate Factory and it still occupies a special place in my heart. Such a twisted and fun movie, and Gene Wilder played such a great role. The remake was a travesty. Last week I visited a new gelato shop which was inspired by Willy Wonka, and found an abundance of vibrant and natural flavors. The Pazzo Gelato Cafe recently opened in North Andover and its website is under construction though their Facebook page has some details about the shop. It is open every day, from 10am-10pm, except Sundays when it opens at 12pm. The cafe can be easily located on Route 114, in the Eaglewood Shops. Besides its Wonka inspiration, it is also an exemplar of duality, a showcase of opposing characteristics. Pazzo, an Italian word which means "crazy," is owned by Jim Demotses, a former lawyer who graduated from Suffolk Law School, the same law school where I graduated. Jim has also worked in restaurants his whole life and eventually realized that food and cooking were his true passion. I can relate to his career change, leaving the legal profession. Jim received his primary training at the Cambridge School of Culinary Arts and immersed himself more deeply into gelato at the Gelato & Pastry Institute of America as well as the Carpigiani Frozen Dessert University in North Carolina. Jim was inspired by Willy Wonka, and one of the cafe walls is covered by a colorful mural which is meant to reflect, in part, the Lickable Wallpaper from the Wonka movie. Though I don't advise licking the murals. The cafe, small and welcoming, has 7 tables, made from reclaimed wood, where you can sit and eat. Jim's philosophy "...centers on providing an authentic Italian gelateria experience by serving freshly-made products sourced from local dairy producers, using imported Italian flavorings and high-quality fresh fruits." Based on my visit, he seems to be living up to this philosophy. There is another colorful mural on one of the other walls, it is is essentially the family mural, presenting images of Jim's family. You can see his wife, Karen, his daughter, Helen, and his son, Andrew. The mural also depicts the village in Campagna, Italy, where Karen's grandfather was born. The murals on both walls were designed by Kate Delaney, a local artist, and there is even a QR code within the mural which leads to a video of Kate designing the mural. One of their glass cases holds numerous baked goods, most which are made in house except for the tea breads. The cookies and muffins are made fresh in the cafe. You can stop by for breakfast, to grab a treat with some coffee or tea. "Bubbles, bubbles everywhere, but not a drop to drink - yet." Besides food, they also sell a variety of drinks, including coffee (from espresso to cappucino), tea and hot chocolate. And the drinks come either hot or cold. They make fresh brewed, unsweetened iced tea which pleased me to see. You can even get frozen drinks, such as an Espresso Frappino or Fruit Smoothie. The first aspect of duality is that the Cafe produces both sweet and savory treats. Though gelato is their primary focus, they also prepare a line of Paninis. You'll find eight paninis on the menu, priced from $7.95-$8.95, and includes types such as Caprese and Chicken Milanese, Vegetarian and Reubino. Each panini is served with a small bag of Utz potato chips. When I arrived at Pazzo, I ordered the Porchetta panini, which consists of thinly sliced, slow roasted Italian herb & spice rubbed pork topped by pickles, tomatoes, Swiss cheese, and chipotle mayo (though I opted for it without the mayo). It was quite tasty, with tender pork and a nice grilled bread, and would make for a good lunch at any time. The primary star of the shop is gelato and they usually carry 20+ flavors, divided into two glass cases. The smaller case contains all of the gelatos with nuts, to protect people who possess nut allergies. The sorbets, which are dairy free, are also differentiated by scoops with blue handles. They even sell gluten free gelato. This is where we find another aspect of duality, local vs imported. Jim is strong in his support of the use of local ingredients but he finds value in imported ingredients as well, especially those from Italy. Locally, Jim uses the following vendors: Shaw Dairy Farm of Dracut for dairy products, CASA Foods of Middleton for imported Italian meats and cheeses, Iggy’s Breads of the World of Cambridge for freshly-baked pastries and bagels, and Jessica’s Brick Oven of North Andover for breads and rolls. He may use other local vendors in the future as well. Jim also plans on using locally grown fruits, from farms and farmer's markets, when they are in season, and gelatos using those fruits will be differentiated as "native" gelatos. All of their sorbets are made from real fruit, and they do not use any artificial flavorings or colorings. When fruits are not in season, they rely on individually quick frozen fruit, which is ripe fruit, cut into pieces, and flash frozen to preserve its freshness and taste. All of their nut flavors are imported from Italy, such as their Sicilian pistachio. They also obtain their biscotti flavoring, rum raisin, and cheesecake from Italy. Their pure vanilla extract is obtained from France and it is alcohol-free, which thus won't interfere with the freezing of the gelato. "And almost everything you'll see is eatable, edible. I mean, you can eat almost everything." Gelato comes in Small ($3.45), Medium ($4.15) or Large ($4.95) and you can get a fresh-made Waffle cone for an extra $1. While I was in the store, they were making the waffle cones and such an appealing aroma pervaded the shop. If you need a larger portion of gelato, you can order it by the Pint, Snack Pack or Party Pack (which holds 2+ pounds of gelato for $19.95). Or opt instead for a Gelato Sundae ($5.99) or Brownie Sundae ($7.25). If you order a Gelato Sandwich ($4.95), they will put your chosen flavor between any of their home-made cookies. Plenty of gelato options. They even sell Gelato Frappes (medium $5.95, large $6.95), which can be topped by home-made whipped cream. I tried one with Banana Stracciatella gelato and it was creamy, thick and flavorful, and who wouldn't enjoy real whipped cream? Jim allowed me to sample any of the flavors that I desired and I sampled nearly all of them, including flavors such as Chocolate Kahlua Brownie, Almond Coconut, Toasted Almond, Chocolate Sorbet, Stracciatella, Cheesecake with Amarena Cherries, Banana Stracciatella, Lemon Sorbet, Watermelon Sorbet, Pineapple & Orange Sorbet, Caramel and Pistachio. For their Pistachio, they use 100% Sicilian pistachios, and no other filler nuts like some other places do. Pistachios are expensive, which is why some use fillers. This gelato had such a prominent pistachio flavor, tasting exactly like a handful of nuts. It tasted fresh and natural, with a delightful creaminess. In fact, nearly every flavor I tasted possessed a bright, fresh and natural taste. The fruit sorbets tasted like fresh fruit, and not some artificial flavorings. I very much enjoyed the Watermelon Sorbet and the Lemon Sorbet was quite refreshing. The Caramel, Chocolate, Banana and Vanilla flavors were all bright and delicious too. The Stracciatella presented a smoother, rich and less crunchy chocolate than you find in the usual Chocolate Chip. Even though I am not a huge fan of cheesecake, I enjoyed their Cheesecake with Amarena Cherries. The only disappointment for me was the Almond Coconut which I felt didn't deliver as prominent a coconut flavor as the other flavors did. All of the other flavors were compelling, and would appeal to any gelato or ice cream lover. This is damn good gelato. Jim took me into the kitchen and showed me how they make gelato. They begin with either one of two bases, one white (pictured above) and the other chocolate. The white is mostly whole milk, a little cream, vanilla, and stabilizers. I got to taste both bases and they too delivered strong, rich flavors of vanilla and chocolate. The process allows much creativity, and Jim is always experimenting with different gelato flavors. Above, Jim is preparing to make a Tiramisu ice cream. This raises another aspect of duality, as much of the gelato work is artisan, done by hand, yet the process also include a high-tech component. Once the gelato mixture has been completed, it is poured into the batch freezer. Jim purchased a Carpigiani batch freezer, from Italy (costing around $30K), a highly advanced machine which ensures a perfect gelato. It only takes about 5-6 minutes to make a batch of gelato, though a bit longer in the morning until the machine has had a chance to get cold enough. With this machine, Jim can make enough gelato during the day to fill his two cases. Most of the gelato flavors are made once a day, and sometimes twice a day. Occasionally, a gelato is left in the case for two days but no longer than that. The nut gelatos are always made at the end of the day so as to not contaminate the other nut-free gelatos. At the end of the day, the machine is then thoroughly cleaned for the next day. Once the gelato comes out of the batch freezer, it will be placed into a blast chiller, at about -40 degress Celsius, for a short time to prevent the gelato from developing ice crystals. Pazzo's commitment to the support of the local community takes shape in other ways besides their purchase of local products. They hire co-op students from Greater Lawrence Regional Vocational Technical School to work at the shop. They reduce their carbon footprint by implementing green practices, including working with Black Earth Haulers, a food composting company based in Gloucester, which transports food waste to Brick End Farm in Hamilton to be turned into usable compost for local farms. On the counter, you will even find "community jars" for tips, and the employees donate those tips to different local charities each month. Though new, Jim still looks to the future, and how he can grow and make Pazzo even better. He will continue to develop and create new gelato flavors. He would like to work with local restaurants and develop special flavors just for them. I think the future looks very bright for Pazzo Gelato Cafe as they are producing a high quality and delicious product. Their gelato flavors will appeal to even the most discerning palate, and they satisfy with their prominent, bright and natural tastes. Kudos to Jim and I wish him the best of luck in his endeavors. Rant: Sake Don't Need No Stinkin' Scores! Should Sake be rated by the 100 point system? Earlier this month, I posted about a recent issue of Wine Spectator (May 21, 2013), which contained articles on Sake, as well as tasting notes for over 50 Sakes. Kim Marcus, Managing Editor, and Bruce Sanderson, Senior Editor, blind-tasted the Sakes, using Bordeaux-style glasses, and did not write about a few Sakes which did not reach their minimum quality level. They grouped the Sakes, all premium, into six categories: Junmai Daiginjo, Junmai Ginjo Junmai, Daiginjo, Ginjo and Honjozo. They did not include in their tasting some of the more unique types of Sake, such as Sparkling Sake, Kimoto/Yamahai, Nigori, and Koshu. The name of each Sake included the Prefecture, the region of origin, though that is not the usual way Sake names are listed. It is good to include the Prefecture within the description but it would better if it were not within the name as that will only make it more confusing for consumers. For example, if they tried to order a Sake online, they would likely see the Sake name, but maybe not the Prefecture. They might hesitate to order that Sake, believing it is not the same as the one they saw in Wine Spectator. Rather than evaluate the Sakes by their usual 100 point system, Wine Spectator listed the Sakes as Good, Very Good or Outstanding. Within their tasting notes, they commonly mentioned a brief description of flavors, the aromas and mouthfeel. Kyle of Colorado Wine Press wrote about the Wine Spectator's Sake reviews, noting the lack of numeric scores. Kyle stated, "I think the method was more effective at describing the sake than if they had used points, but I clearly am not an advocate of the 100-pt system." In the comments section of Kyle's post, Thomas Matthews, the Executive Editor of Wine Spectator, mentioned, "We have much less experience with sake, and felt that broader categories would be more appropriate to express our opinions on their quality. However, I could easily see a critic with deeper experience in sake using the 100-point scale, and perhaps if we taste extensively enough, one day we will too." That explains why they did not use numeric scoring and shows a sense of humility, that they were not trying to claim experience and expertise that they did not possess. Maybe other wine writers could follow their example when tasting wines of which they have little experience. I have seen a few magazines and critics numerically score Sake but it is relatively uncommon. I would prefer that Sake is not scored in that manner as I believe it could have a negative impact on Sake consumption. I don't see sufficient advantages to numeric scoring to outweigh the potential negatives. Describe it, evaluate it, but don't score it. Why do I feel this way? First, numeric scores have not made some other niche beverages more commonly popular. For example, let us consider Sherry, a wine that inflames my passion. However, most people still don't drink Sherry, especially the dry versions, and less Sherry is sold in the U.S. than even Sake. Sherry is commonly numerically scored but obviously that is not a guarantee of increased consumption and sales. So why should scores guarantee more Sake consumption? There is no guarantee. Second, one of the compelling aspects of Sake is its relative low ceiling on its highest prices. Usually, you won't find a Sake for more than $150 a bottle. And the prices are often closely aligned with the costs of producing Sake. There are exceptions but they are rare. Compare that to the wine world where there are plenty of wines costing more than $150. And one of the most significant factors that has led to those high wine prices are numeric scores. I don't want to see Sake prices get inflated merely because they garnered a high score. Higher prices will only drive more consumers away. Third, numeric scores could promote lazy distributors, store owners and restaurants. As it stands, many of those people and establishments need more basic education about Sake. Learning about Sake is an excellent way for them to be able to sell more Sake, just as wine knowledge helps them sell more wine. They need to invest the time and effort into Sake education, just as they do wine. If these people can just point a customer to a high scoring Sake, there is less incentive for them to learn about Sake. Scores gives them an easy out. Fourth, what Sake taste profile should critics base their numeric scores upon? In general, American palates prefer aromatic, big, bold and rich flavored Sakes. Is this a side effect of consumers following the perceived wine preferences of Robert Parker? Possibly. On the other hand, the Japanese generally prefer more subtle Sakes, which might have muted aromas, and which may be “as easy to drink as water.” Which style would or should garner high scores? If a prominent critic's numeric scores reward big, bold Sakes, then there could eventually be a backlash against such Sakes as there has been a backlash against Parker style wines. Both styles need to be embraced, and neither style should be promoted over another. Finally, you can include all of the usual criticisms of the 100 point system to the mix. They are as applicable to Sake as they are to wine. For example, a mere numeric score won't tell you anything about how well that Sake (or wine) will pair with food, or which foods that make the best pairing. And if I pondered the issue more, I am sure I could come up with a few more reasons as well. To get more consumers to drink Sake, the first and most important thing to do it is to get them to taste premium Sake. Too many consumers have had a bad experience with hot Sake. However, once they taste a good, chilled Sake, their opinion can change. The taste of chilled premium Sake is drastically different from the taste of a cheap, hot Sake. It can be an eye opening experience and is more persuasive than any numeric score or tasting note. Wine stores need more Sake tastings. Restaurants need to offer inexpensive tasting flights of Sake, or hold Sake-paired dinners. The best education is tasting. Women could end up leading the path to increased Sake consumption. We already know that women purchase more wine than men, and they are often more adventurous in their purchase choices. At the Sake tastings and events I have held, the most popular Sake, and overwhelmingly with women, has been Sparkling Sake. Low in alcohol, lightly sweet and effervescent, Sparkling Sake is kind of the Moscato of the Sake world. It makes for a good gateway Sake, opening the door to the diversity of other Sake types. Sake doesn't need numeric scores! When I describe Sake to people, I tell them that Sake is not a beer, wine or spirit. I consider it to be its own unique liquor, and my position is supported by numerous Sake advocates. It may bear some similarities to beer, wine and spirits, but it also possesses key differences as well. It may be brewed in some ways like a beer, but drinks more like a wine. Legally, what is its status? Under U.S. law, is Sake treated as a wine, beer or distilled spirit? Curiously, it is treated as all three! The actual determination for any specific Sake depends upon the surrounding circumstances, such as whether it is produced in the U.S., is imported or contains added distilled alcohol. The Alcohol & Tobacco Tax and Trade Bureau details this strange decision making process. First, in matters relating to production and tax, Sake is treated as beer under the Internal Revenue Code. The definition for "Beer" states "...and other similar fermented beverages (including sake or similar products).." The sake breweries in the U.S. are considered more as beer breweries for production purposes and must follow the rules for such beer breweries. However, the law does not address definitions of the various types of Sake, such as Junmai and Ginjo. U.S. Sake breweries can technically use such Japanese terms at will, with no restriction. For example, a U.S. Sake brewery could label any of their products Junmai, even if that product would not qualify as a Junmai under Japanese law. This is similar in some respects to when U.S. wineries labeled their Sparkling Wines as Champagne, though such wines did not fit the French definition of Champagne. Currently, there are about 10 Sake breweries in the U.S., either already in existence or in the process of being constructed. With such a tiny number of breweries, this labeling issue is not significant and I am unaware of any domestic Sake which does not follow Japanese labeling laws. It is something though which deserves consideration, especially as more sake breweries continue to sprout up all across the country. It would be better to handle the matter now, before it ever becomes a problem. Second, in matters relating to importation, labeling and advertising, Sake is treated as wine under the Federal Alcohol Administration Act. The definition for "Wine" states "...other alcoholic beverages not so defined, but made in the manner of wine, including ...vermouth, cider, perry and sake;..." So if you want to import Japanese Sake, you must have an importer permit for wine. In addition, Sake labels and advertising must abide by the same laws as does wine. Third, Sake may sometimes even get treated as a distilled spirit. Some Sake has alcohol added to it and it is generally known as aru-ten, short for arukoru tenka. Honjozo is premium Sake which has some distilled alcohol added to it, as a means of emphasizing certain aromas and flavors which are soluble in alcohol. This distilled alcohol is diluted with water so the alcohol level of the Sake does not rise. It remains around 15%-17% ABV, the same as Junmai which lacks the addition of distilled alcohol. However, under U.S. law, if any distilled alcohol is used during any stage of the production process, then the Sake will be taxed at the higher distilled spirit tax rate. That means that Honjozo will tend to be more expensive than Junmai because of the increased tax rate. Alcohol law in the U.S. is a twisted and convoluted system. Poor Sake has an identity crisis, unsure of what it is supposed to be. 1) After months of swirling rumors, none confirmed, Chef Paul O'Connell wants Boston area diners to know that his French-Latin bistro, Chez Henri, has NOT been sold, nor is it closing its doors anytime in the immediate future. OConnell admits, however, that he has been entertaining some possibilities for change, but there is no firm plan or time frame. In the meantime, OConnell is a full time presence in the Shepard Street kitchen. In fact, O'Connell is re-launching The Latin Dinner Series, a summer dining concept thats been on hiatus for a few years, but was a crowd favorite when it has been offered in the past. Starting on Memorial Day Weekend 2013, and running until the end of June, this sensuous, $39 prix fixe menu is based on recipes from a variety of South and Latin American cuisines. 2) Del Frisco’s Double Eagle Steak House and The Greg Hill Foundation will host Seaport Strong – a benefit to support those tragically affected by Boston Marathon bombings. The event, which will feature special guest bartenders such as New England Patriots players Danny Aiken and Zoltan Mesko, will donate 100% of the proceeds to the affected families and victims. On Tuesday, June 4, at 6:30pm, for $50, guests will enjoy Del Frisco’s signature passed hors d’ oeuvres, VIP cocktails, and a silent auction, all while mixing and mingling with their favorite Boston athletes. To purchase tickets, please visit The Greg Hill Foundation. For more information, call Del Frisco’s at 617-345-3941. The Greg Hill Foundation is a 501c3 organization that was founded by Greg Hill, host of WAAF’s Hillman Morning Show. This unique foundation responds to immediate requests for assistance, to improve the lives of local families touched by tragedy, through matching the charitable donation of Greg's media audience. 3) The staff of Forum will be taking over sister restaurant, Noche, in order for the chef to test new menu times that will be on the Forum menu when it reopens and it will also allow the Forum staff to see loyal guests and friends while Forum is under renovations. Newly appointed Forum Executive, Chef Matthew Barros, will be hosting test dinners at Noche every Friday where the Forum menu will be introduced to guests as part of a weekly-ticketed event called “FORUM FOR ONE”. Proceeds from this multi-course dinner will benefit Boston’s ONE FUND. Proceeds will benefit Boston’s ONE FUND and tickets are $75 per person, Tickets can be purchased by logging onto www.forumboston.com. 4) 51 Lincoln, in Newton, is launching a weekly hands-on cooking series that will take place every Saturday called The Cooking School. Chef Fernanda Tapia will guide the class through a variety of topics ranging from the fundamentals of cooking to advanced techniques such as butchering a whole animal. After each class, the students are able to enjoy the fruits of their labor- a multi-course meal- paired with wine. Classes all take place from 9am-12pm every Saturday and will range from six to twelve students. Reservations should be made in advance online at The Cooking School. Education is important to 51 Lincoln Chef/Owner Jeff Fournier as he is currently a culinary instructor at Boston University and Chef Fernanda was one of his students and now works for him at 51 Lincoln as one of his key chefs. When: The Cooking School at 51 Lincoln starts on Saturday, June 8 and all classes are listed below. A beautiful view of Kaniatarowanenneh, the "big waterway" which is more commonly known as the St. Lawrence River. This is one of the sights I viewed during TasteCamp, a three day visit to Quebec, tasting wines, ciders, beers and local foods. However, this view was not on our itinerary and was discovered during a detour to eat some poutine. Outside of the official Taste Camp events, I used my free time to explore some of the other culinary offerings of Quebec and Montreal. I found much that was worthy of mention, from excellent restaurants to a killer food market. However, I didn't take many photos of these extracurricular activities as I chose more to relax and savor the food. I still want to rave about them though, to provide some recommendations for anyone traveling to Quebec and Montreal. I arrived in Montreal on Thursday night, a day early for Taste Camp, so I had some extra time to explore the city. For dinner, I went to Kaizen, a Japanese sushi bar and restaurant located on St. Catherine's Street. This is a sleek and rather large restaurant, divided into several different rooms. The main dining area has a high ceiling, and possess a nice elegance though without being stuffy. However, the background music was a bit disconcerting, making it seem more like a lounge than a restaurant. The menu was extensive, including lots of intriguing selections, and includes much sushi, which you can get with brown rice instead of white if you so desire. We ordered some sushi, all which was fresh, large and delicious. The tamago, the omelet, was especially tasty, one of the best I have had. The organic salmon sashimi was also very good. For hot dishes, the fried calamari was some of the best I have tasted, small and tender rectangular pieces with a delightfully crisp batter. The sweet potato fries came with a curry-like dipping sauce topped by thin slices of foie gras. The crisp, plump fries went well with the dipping sauce and the foie was heavenly. A large bowl of mussels were prepared in a savory Sake broth, and they were addictive. Everything we ate was fantastic. I was disappointed with the tiny number of Sakes on their wine list, and the only one that appealed to me cost over $600, which is not within reach of my wallet. The list though had a superb collection of wines, albeit pricey which is a common issue with most restaurants in Montreal. The wines came from all over the world, and included plenty of quirky and interesting wines. Wine lovers will certainly love perusing this list and will be sure to find something of interest. We ordered a Priorat white wine and an Austrian Blaufrankisch, both which I enjoyed. Service was impressive, including the sommelier. We had to send back the first wine we ordered as it was flawed, and the sommelier took it right back without question. The food was reasonably priced and we left the restaurant very satisfied. Kaizen receives a strong recommendation. On Friday morning, Taste Camp began with a late morning winery visit. I and my traveling companions, including Adam of Wine Zag, were a bit early so we drove around exploring the area. We stumbled upon the above roadside restaurant, drawn by the fact that they served poutine. I later learned that this restaurant has been around for many years and is a bit of a landmark. Poutine was likely invented in the 1950s in Quebec and essentially consists of french fries topped by brown gravy and cheese curds. There are plenty of variations, but the basic form is quite satisfying. Adam had never had poutine before so this was his opportunity to taste this decadent and fattening dish. A Poutine Virgin. We all, including Adam, enjoyed the poutine, while sitting looking out over the St. Lawrence River and you can see our view at the top of this post. A perfect way to start the morning. Our hotel was on the border of Chinatown and I spent some time exploring the streets of this small neighborhood. There were dozens of restaurants, bakeries, tea shops, souvenir stores, and more, ranging from Chinese to Vietnamese, Japanese to Thai. One of my first stops was to My Cup Of Tea, a bit of a high end tea shop, selling tea, cups, kettles and other tea-related items. It has a great collection of different teas, mostly loose leaf teas, and the quality seems high. I bought some Silver Needle White tea. There was a tiny stall selling Dragon Beard Candy, a candy supposedly once reserved for only the Emperor. It is essentially strands of sugar surrounding a mixture of nuts, sesame seeds, coconut, chocolate, and sugar. The candy is made by hand, where a disk of corn starch and sugar is pulled continually until you get many thin strands. When completed, the candy resembles an insect cocoon and has some of the stickiness and texture of cotton candy. The inner mixture is very pleasant, a melange of sweet flavors and textures. A must stop in Chinatown for this unique treat. One evening, we sought out a place for a late dinner and we were nearly overwhelmed by the myriad choices. We sought a place that wasn't a tourist trap, a place where locals dined. After some consideration, we selected Keung Kee Restaurant, which was hidden away on a second floor and it turned out to be a winner. It is a medium-sized spot, with plenty of large round tables, with lazy susans, for big parties. It isn't fancy or elegant, more just a serviceable restaurant. The menu, which is in both Chinese and English, is lengthy and the dishes are reasonably priced, nearly everything under $15. The choices include Thai, Chinese and Americanized-Chinese dishes, a variety from Chow Mein to Jellyfish, from Thai Style Fried Shrimp to Pork Chop with Peking Sauce. The Deep Fried Wontons ($4.25) were crunchy, filled with shrimp and quite tasty with a sweet sauce for dipping. A nice way to start our meal. The Fried Rice Noodles with Beef ($8.95) consisted of a large dish of flat noodles, with lots of tender beef and veggies, topped by a delicious brown gravy. The Half Crispy Chicken ($10.95) was exactly that, with moist meat covered by crisp and tasty skin. That skin was addictive! The BBQ Pork ($9.95) was a large dish of thin sliced BBQ pork, tender and tasty. The dishes seemed fresher than you get at some places, and the flavors were balanced. Definitely a place food lovers should check out. Another evening, we went to Chinatown just for soup dumplings! While driving through Chinatown, I saw a large sign for the soup dumplings and knew I had to check it out. We went to Qing Hua Dumpling and were almost disappointed. They were preparing to close for the evening, but we convinced them to stay open for just a bit longer so we could have some soup dumplings. We didn't even really get to peruse the menu. We ordered a couple of basic pork soup dumplings, and our server recommended we also order lamb and coriander soup dumplings. It seems their menu doesn't offer much beyond dumplings, though they have several varieties, including chicken, lamb, and uni. The dumplings were excellent, with a savory broth and plenty of nicely spiced meat. The lamb dumplings were a different style than the pork, but it seemed more a cosmetic issue than anything else. They filled my need and I would return again another time to try more of their soup dumplings. An uni soup dumpling sounds intriguing. One of the afternoons, we decided to stop at the Jean-Talon Market, one of the largest and most popular food markets in Montreal. Within the main building, you will find a huge amount of fresh fruits and vegetables, as well as plenty of plants. You will also find on the outskirts, and on the streets surrounding the market, a diverse amount of food & drink stalls and shops. Meat, seafood, cheese, mushrooms, wine, olive oils, spices, bread, bakeries, crepes, chocolate, ice cream and more. What a superb collection of shops that will appeal to any food lover. I had a great time in the La Fromagerie Hamel, a cheese and gourmet food shop, and I purchased numerous local Quebec cheeses. In other shops, I bought wine to take home and a crusty baguette to eat while walking around. I probably could have spent much more money here and filled my trunk with plenty of foods to take home. A must visit for any food and wine lover. Rant: How Do You Melt Cheese In A Fridge? Want Lunch? Just Say Phu Ket! Rant: Brandt Beef, Is It "The True Natural"? Don't Wait In Line At Shake Shack!